The educational initiative of the ENGIE group, J’apprends l’Energie (learning about Energy), awarded the winners of the Une Toque à la Cantoche competition at the Bastille Opera House. Eric Briffard, Executive Chef and Culinary Arts Director at Le Cordon Bleu Paris institute, is a jury member for the second year running alongside Guillaume Gomez, Chef in charge of all the kitchens at the Élysée Palace. During the event, the chefs award prizes to young individuals for their commitment during the competition. This is a subject that is close to Chef Briffard’s heart, as he strongly believes in sharing his passion and respect for quality ingredients. Created by ENGIE as part of its J’apprends l’Energie (learning about Energy) educational initiative, the Une Toque à la Cantoche competition aims to make students aware of environmental issues through the creation of a recipe, or menu, which is of excellent quality, and efficient in terms of energy resources used, in partnership with teachers and the school catering Chef. Students make sure that other classes are aware of the competition before the recipe is served at the establishment’s canteen. The competition is aimed at primary and secondary school students, with levels of difficulty which are adapted to their age. 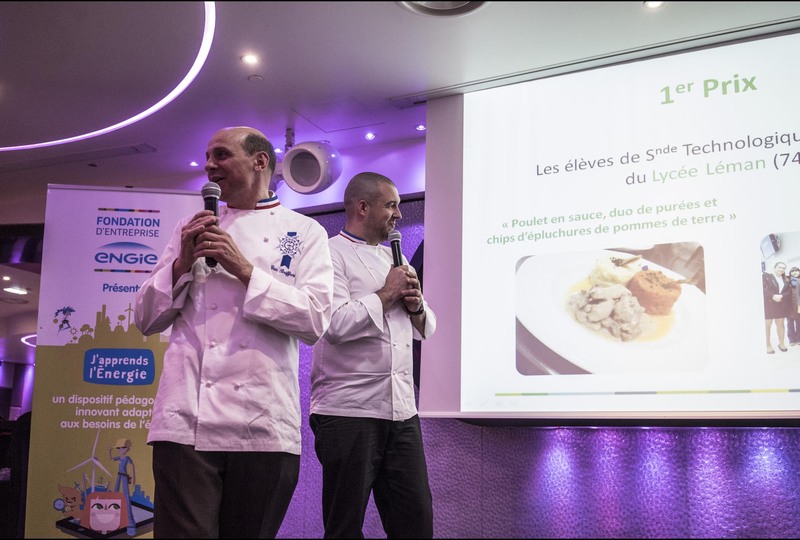 In previous years, the competition received the support of chefs Georges Blanc (3 stars in the Michelin guide) and Thierry Marx. A promising initiative which aims to increase students’ awareness from a very young age!